During an hiatus from blogging the notion of wirearchy continued to hang around and get noticed here and there. Recently it seems that awareness has been spreading and growing. I hope this continues. 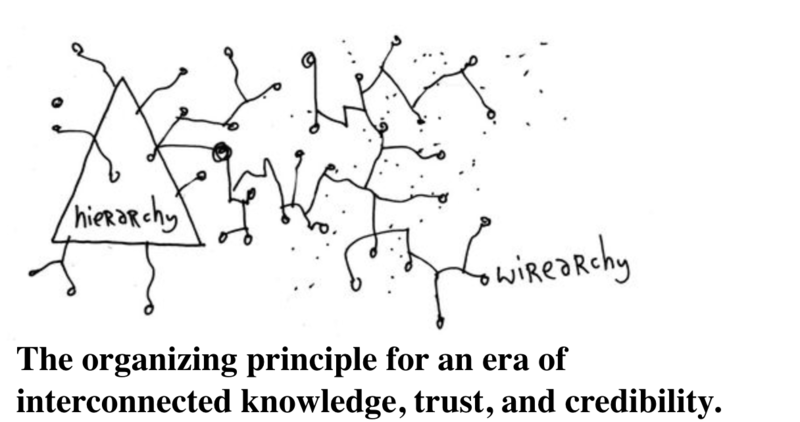 Over the past decade a large number of people have asked, once interested in the neologism wirearchy, what it is and most specifically “how to do it”. I always reply that I am not going to offer specific answers because I want the concept of wirearchy to become identified as an organizing principle. I think that sounds arrogant of me, but it seems important to me that the concept is a principle only, not an approach or methodology that might be followed as a recipe. The market for ‘organizational transformation’ seems to be crying out for a solution. The methods appearing these days have a number of characteristics that I think will prove to be useful in going some of the next steps towards more responsive, accountable and adaptive organizing. But basically I don’t trust prescriptive approaches to be flexible enough and adaptable enough to be of continuous use. In order to realise the benefits of variety and diversity of human groups, I want to suggest that all those concerned with organizational design and change should work from principles. It’s essential to consider context and specific industry, market and talent challenges and decide how to get involved in a continuous and iterative process of Near Future Design Thinking. … that the organization will transform rapidly. It has reported going over the 5 years from mid-50’s to early 80’s percent engagement with the company’s mission and values. That has taken the full 5 years, and that was with the advantage of building on an (my opinion) already fertile seedbed. It also has highly intelligent and/but hard-driving senior executives who are (in my limited experience) well aware of the human sociological issues and organizational dynamics. While relatively prescriptive in some ways, the leaders have been careful to engage the whole organization to a tangible degree in the validation and enactment of vision and values (an all-important process). The design of transformational evolution and development-based growth of a more responsive and resilient organization and organizational culture begs the issue of seasoned practical, conceptual and philosophical advice and accompaniment. In that vein, there are some professional individuals and professional consulting firms that by now have been exploring the deeper issues of both “Enterprise 2.0” and “Social Business” and who have enough expertise to criticize and/or refute the points I’ve set out below .. these people that have my admiration and respect are (for example) Harold Jarche, Dion Hinchcliffe, Lee Bryant, Dave Gray, Euan Semple, Megan Murray, Dan Pontefract, Rob Paterson, Esko Kilpi, Dave Snowden, John Hagel, Anne-Marie McEwan, Anthony Poncier, Dominique Turcq, Luis Alberola, Charles Jennings, Bertrand Duperrin, Steve Denning, Rawn Shah, Sameer Patel and others I will have omitted but belong on this list. The previous era was dominated by one model of how organizations were supposed to look and act, and this dominant model was derived from the maturing of the application and codification of the principles of Fordism and Taylorism to virtually all aspects of our society. The codification and enactment of those principles has led to massive (or even beyond-massive) growth of a consulting industry and consulting firms that 40 or 50 years ago were small-ish accounting and / or other professional services firms. As the world has become more complicated and more complex, these firms have become massive and (often) global). I won’t bore you with the business model requirements necessary to scale in such a way, and/or how that demands a significant amount of homogenization of prescriptive model-and-method based advice and support. I am sure you can figure it out. Thus, consulting firms in many areas of consulting have long since learned to promise solutions primarily because that is what client organizations buy, married with the demands of the business model.. I am not fond of this logic and the attendant market dynamics, primarily for philosophical reasons. Recently there’s more and more talk of how organizations need to be in the hands of stewardship-oriented leaders (who understand that organizations are collections of people-on-purpose). The impulse behind this growth in interest is aimed at facing current conditions head-on and beginning the work and the journey of learning to survive and thrive in new conditions (conditions that will only be encountered more frequently and more intensely). Here are 10 considerations that I think are key for whatever forward decisions are made about why and how any given organization chooses to begin facing the future and taking action to realize constructive and positive change. Rather than offer a solution, below are 10 broad and general pieces of advice when thinking about what and how to get started or keep going. 1. There will not again be one dominant method or model; there will be variations on a theme depending upon the context and type(s) of networked environments and activities. 4. The organization’s IT architecture – issues such as cloud, BYOD, use of SaaS applications, collaborative platform(s) (internal) and social media tools, platforms and expertise (external) – needs to be flexible, robust, resilient and as open as possible. This is an area where I believe Dion Hinchcliffe is the world’s leading thinker and explainer. 6. Organizational Network Analysis (ONA) is in my opinion key to renewing the pertinence of the work of the Human Resources domain. It can be used in order to identify bottlenecks, under-appreciated resources or poor work design .. and to gain strategic perspectives on organizational politics, talent management, organizational change. Just don’t spy on employees in order to exploit and manipulate them. 9. All parties involved need to modernize the philosophy about and approaches to areas of organization rigidity (e.g. unionized work); plan for sustainability and ongoing evolution. An example that comes to mind is an organization’s contract-based work design and compensation philosophy and practices. Compensation, talent management, performance management and development .. all of these need to be re-conceived. For example, if I were CEO and wanted to get my organization’s employees attention and possibly their engagement, I would a) cap executive compensation at reasonable multiples of the average pay of workers in the organization. Any additional compensation would be deferred long-term (substantive long-term) and tied as closely to the performance and progress of the organization at as a whole, which means probably not the shareholders interests foist and foremost (yes, I know that’s not how things work in the real world). I’d also explore the notion of gainsharing rather than pay-for-performance (otherwise known as variable compensation or performance-based pay). Gainsharing is a concept that gained some momentary visibility in the 80’s and (maybe) early 90’s, but then more-or-less disappeared as organizations 1) began dealing in more forceful ways with unions, and 2) battening down the hatches when it came to optimization and the deep search for efficiencies. I think it’s likely that gainsharing is a more appropriate way, in my opinion, to add to the base salaries of people working in networked environments, and in general is well aligned with the philosophy and practices emerging for the more socially-connected era we are entering. As another thinker and writer I admire (David Weinberger) once said a long time ago .. “We’ll see what happens”. Nice post Jon, and one I quite agree with. It’s all about working on the system isn’t it? If you build the system to promote/encourage the kind of behaviours you want to see, then humans will generally adapt to that environment pretty well. I suppose the challenge will always be that prescriptive methods are often an easier sell as they don’t require as much thinking on the part of the recipient. If you add into the mix that these prescriptions often have some case study based support and it can be quite an easy decision to make for a manager. Not the right one perhaps, but a much easier one. I think that’s pretty much it. I think that’s in an important sense what the consulting industry has been built on. The trouble with bringing into being some sort of system that involves people, information, hyperlinks and technology(ies) is that each context and set or sets of people and information is different and in today’s and tomorrow’s conditions very likely to be subject to significant change either quite regularly and / or quite suddenly. And then what for the (just previous) solution ?